After five years touring every major comedy festival in the world, multi-award winning comedy-rock powerhouse Dead Cat Bounce are finally hanging up their leopard print trousers. On 20 September 2013, all four members will reunite for the first time in almost two years and take to the stage for their last ever show. 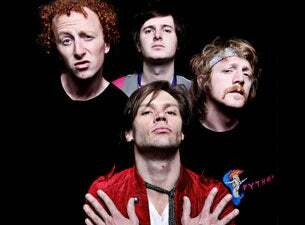 Part rock band, part international comedy sensation, part four guys who have spent an uncomfortable amount of time together, Dead Cat Bounce have toured the world relentlessly, becoming one of the most exciting live comedy acts on the planet. They have performed their rocking stage show to packed houses and critical acclaim at the Montreal Just for Laughs Festival, the Melbourne International Comedy Festival, the Sydney Comedy Festival, the New Zealand International Comedy Festival, the Kilkenny Cat Laughs, the Dublin Fringe and the Edinburgh Festival Fringe; where they were the house band at the legendary Late’n’Live Show. Dead Cat Bounce made their TV debut in January of 2009, with their pilot airing as part of RTÉ’s Project Ha Ha. Since then they have appeared on regularly TV shows and Galas on RTÉ, Channel 4, BBC and on channels in Canada, Australia and New Zealand. The video for their song “Rugby” went on to become one of the most watched internet videos in Ireland for 2011, clocking over a million views on YouTube. Their first feature film, “Discoverdale” is currently winning awards at film festivals all over the globe. They are probably the only act in the world who have supported both Jason Manford and the Darkness. They return to Vicar Street for one spectacular night to leave it all on the stage. As seen on RTÉ 2’s Republic of Telly, Channel 4, BBC 3 and BBC Comedy online. Winner of the Time Out Jury Prize, Sydney Comedy Festival 2010. Winner of the People’s Choice Award, Sydney Comedy Festival 2011.